My five-year-old daughter has life-threatening food allergies. 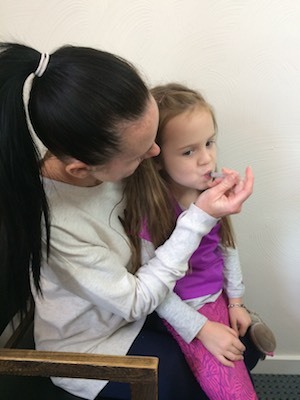 In this article, I describe the social-emotional and medical reasons she will begin receiving Oral Immunotherapy Treatment (OIT) for her allergens. In the above statements, if words had expanded upon “because,” would it make amends? Would an explanation after the word “because” negate any negative emotions those statements invoked? Does the reasoning/diagnosis/rationale for those statements substantiate them? As a mother to a child with food allergies, I’ve witnessed those statements materialize within my daughter’s life. Food allergies are common, yet complicated. They affect 1 out of 13 children, and therefore, due to their frequency and variance in expressed symptoms, can be treated with indifference, which can have grievous ramifications. Often, food allergies are present in otherwise “healthy” children, but that health is firmly dependent upon vigilance for it to be sustained. In most daily instances, it would be cruel to exclude one individual repetitively, especially a child. Sometimes the exclusion is deliberate, other times it is unintentional. Regardless of intent, I see the look of rejection cross my five-year-old’s face, despite her stoic attempts at acceptance. She understands that certain situations are dangerous to her, yet that doesn’t eliminate the hurt. While I do not have all the answers regarding how to combat the issue of exclusion for individuals with any form of medical need, I do believe having empathy is paramount to limiting its psychological toll. Empathy is the ability to understand and share the feelings of another. Despite frequency of occurrence, food allergies leave those affected vulnerable to potentially fatal encounters. Widespread management has been the message to avoid contact with allergens. For many, avoidance extends far beyond not ingesting the allergen. For some, avoidance of having one’s allergen present in the environment is required to prevent reactions. Despite diligent attempts at avoidance, my five-year-old daughter has still suffered reactions. Anaphylaxis, which is a severe and potentially life threatening reaction, has occurred four times in my daughter’s life. Milder reactions have occurred innumerable times. With food allergies, there is no safeguard to guarantee a reaction will be minor. My daughter with food allergies, while otherwise healthy, requires relentless caution to ensure her health is preserved. When allergens become present, the situation can progress from a few bothersome hives and self-limiting temporary discomforts to wheezing and swelling of the throat, requiring immediate life saving intervention through the use of epinephrine. When you’ve heeded the doctor’s advice to avoid known allergens yet reactions occur, you are left wanting a better solution. When your child is excluded from birthday celebrations, outings and fun events and feels the pain of rejection, repeatedly, you want another solution. When others can’t be “bothered” to have compassion for your child’s needs, your heart becomes burdened for your child to exist in a world with more love and less selfishness. Oral immunotherapy (OIT) is a method in which individuals with food allergies are desensitized to their allergies. One is not “cured,” but rather the goal is to not react when exposed. Desensitization occurs under the careful protocol of an allergist, and should never be attempted on your own. An allergist who offers OIT will determine the amount of allergen to be consumed orally. This “dose” of allergen is consumed daily, beginning with minuscule doses with periodic appointments to increase the dose. During treatment, mild self-limiting reactions are common and transient. The risk of anaphylaxis over the entire length of treatment is approximated at 5%. The end goal is to be able to safely and without adverse incident be exposed to—and possibly consume—the former reaction-causing food. With OIT, no longer is avoidance the only option in regards to management. OIT provides safety from reactions. OIT provides inclusion, as there is no longer a need to avoid certain environments and be excluded. OIT eliminates the need for others to be empathetic to the person’s needs, as safety will no longer be dependent upon an allergen-free environment. OIT, while life changing, requires thoughtful consideration. Treatment involves daily dosing, frequent appointments, potential lifestyle change to accommodate to dosing requirements, and cost. For many, the biggest hurdle of all is mental. Allowing yourself or your child to ingest foods that in the past may have proven fatal can be frightening. My daughter, who is allergic to milk, peanuts, and tree nuts, is beginning desensitization with OIT to her milk allergy this September. The thought that an adverse effect could occur is daunting; however, the reality is that that risk is always present, as we’ve witnessed countless times. I am moving forward with OIT so that my daughter is in control of her allergies. No longer will her allergies control her. All parents, regardless of how mild or significant their child’s needs may be want nothing more than the best this world has to offer their child. My hope is that sharing the option of OIT with other parents of kids with food allergies will present an opportunity to overcome at least this one hurdle in a child’s life. Lindsay is a mother to three children and resides with her husband in western Pennsylvania. She is appreciative of the opportunity to care for children with diverse medical needs as a pediatric private duty RN.